Review: American Football, 'American Football' Just like that, the emo band returns 17 years after its debut album — a bit older and a bit more introspective, yet still holding on to that teenage feeling. The guitars fade in, as if to pick up where they left off, or to suggest that they'd never stopped twinkling. "Where are we now?" Mike Kinsella sings, his voice a little worn, but softened like suede. "We're both home alone in the same house / Would you even know me if I wasn't old me? / If I wasn't afraid to say what I mean?" 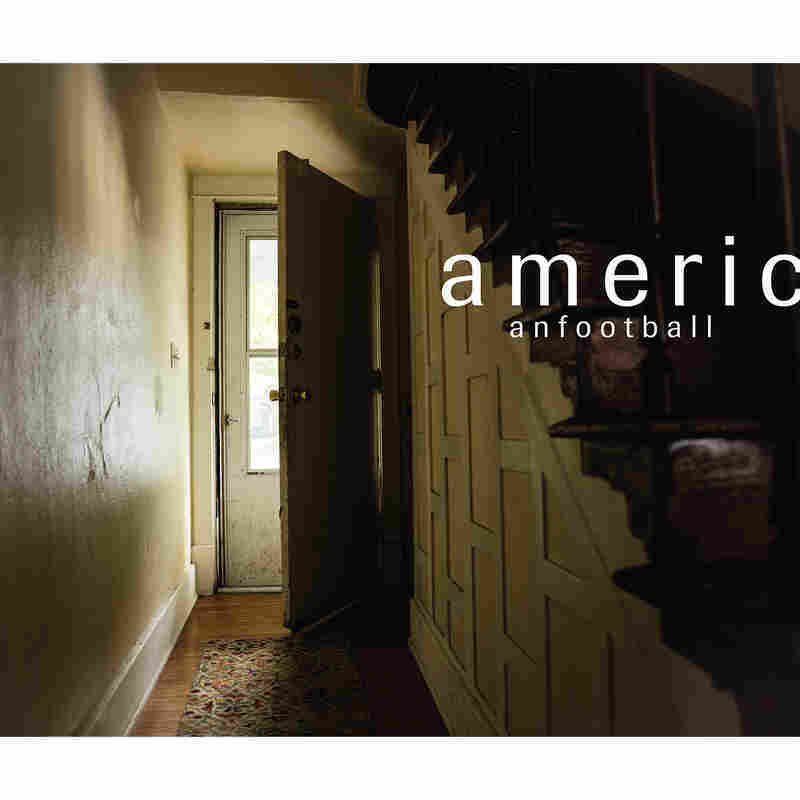 Just like that, 17 years after its eponymous debut, American Football returns from whence it came, with even the same house featured on the album cover. In its first iteration as a trio of young twentysomethings, American Football wrote intricate, bleeding-heart rock songs that made no effort to rock. With its drumstick count-off and anticlimactic follow-through, mixtape staple "Never Meant" was a grinning send-up of macho rock 'n' roll that made a significant impact on teenagers for years to come. When the original members — guitarist Steve Holmes, guitarist/vocalist Mike Kinsella and drummer Steve Lamos — reunited (along with Nate Kinsella on bass) for a series of performances in 2014, it felt like just a one-off celebration for a band that never got a victory lap the first time around. But they'd have to forgive fans for being nervous when American Football announced new material. What does teenage angst and pining sound like from grown men entering their 40s? As it turns out, it sounds a bit older and a bit more introspective, yet it still holds on to that teenage feeling. While the other members largely put music on hold since the breakup — Holmes hadn't really touched his guitar since the late '90s — Mike Kinsella has made a modest but fruitful career as Owen, in addition to recordings with Owls and Their / They're / There. In fact, this year's Owen LP, The King Of Whys, is very much the spiritual counterpart to American Football's follow-up, with haggard, sometimes defeated meditations on middle age. But where Owen is lyrically wry and direct, American Football 2.0 channels the longing poetry of Kinsella's younger years, but with perspective. Case in point: "Give Me The Gun," already half-cocked with a title like that, closes with this sappy sentiment: "You're so delicate / Admittedly, sometimes I forget you're made of wet paper." But Kinsella is never not earnest, as he told NPR in September: "This song is just me checking in on a distressed loved one, done in my best Bernard Sumner impersonation." If the beating heart of American Football is lined with notebook scribblings, then let it forever irregularly thump in 7/4 time. The band's experiments in time signatures — sometimes with the guitars playing one while the drummer plays another — are what always set it apart from its peers and imitators. LP2, which we'll call this album from now on, truly picks up where American Football left off musically. "My Instincts Are The Enemy," "I've Been So Lost For So Long" and "Desire Gets In The Way" scratch that old itch with gentle harmonics, interlocking guitars and Lamos' crisp, complex, tone-rich drumming. But as we've seen with Braid, the key to a successful reunion album is to recognize what originally made the band great, while simultaneously acknowledging that times have changed. American Football knows its soul and stretches out into poppier and more atmospheric gestures in tracks like the acoustic-led soft-rocker "Home Is Where The Haunt Is" or the waltzing "I Need A Drink (Or Two, Or Three)," which glistens with Volcano Choir-like oohs and ahhs. But the most impressive marriage of the old and the new is "Give Me The Gun," which gets built up from the bass and Lamos' breathtaking drum work as a gently struck vibraphone, ambient guitar and Mike Kinsella's voice float atop, sounding something like Steely Dan's Aja for the grown-up emo set. Listening to LP2 is like revisiting an old wound — the kind that hurts so good. It's a nostalgic indulgence that wears its weariness through a faint smile, acknowledging the way our new faults are sometimes the same as the old ones.